When it comes to the word Sporty Look for an outfit, all I can think of is comfortable. Sporty look for me is the easiest daily outfit I can think of! All I need is to pair a normal or over-sized top with any shorts and favourite sneakers or sport shoes, and voila! To enhance the sporty look, baseball cap is the best accessory to match with because how can it be sporty without a cap on?! However, there are a lot of people are uninspired when it comes to creating an outfit with a baseball cap. 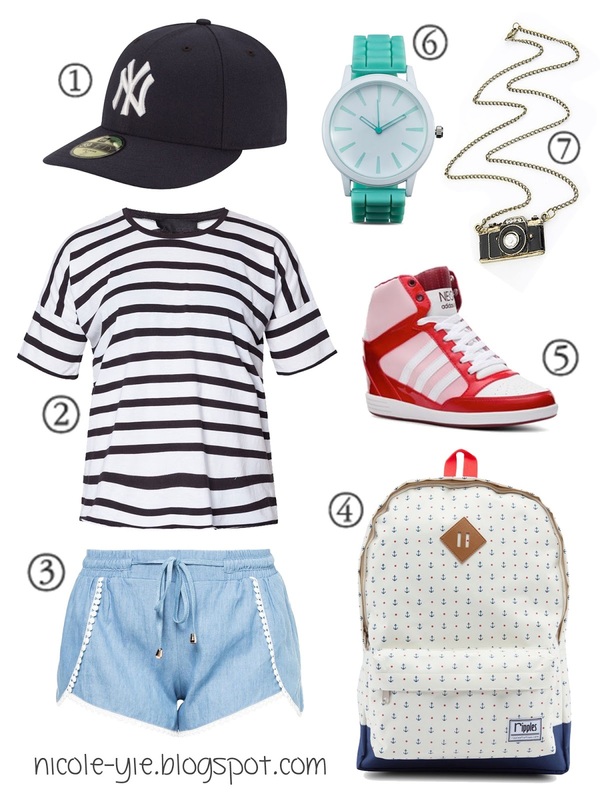 So here's an outfit idea by myself to create a sporty look with baseball hats! As I mentioned, a larger size top looks better in a sporty luxe look, so I picked this Mono Stripe Tee which can be found anywhere easily. A bag pack is definitely a must for a sporty look as well! My favourite item besides the cap in my list is definitely the high ankle sneaker! Since the shorts I picked are not too long, a high ankle sneaker will not make you look shorter. Besides, sneakers speak everything sporty! So what do you think about my idea for this round? Let me know if you have a better idea for this mix and match look!